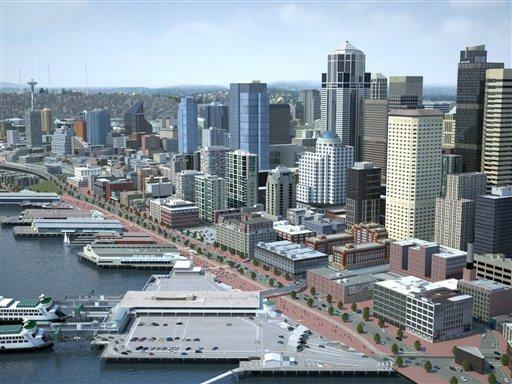 SEATTLE — A $4.2 billion tunnel beneath downtown Seattle is the best option to replace the crumbling Alaskan Way viaduct along the city’s waterfront, Gov. Chris Gregoire said Tuesday, as opponents filed an initiative to block construction. Joined by Mayor Greg Nickels, King County Executive Ron Sims and Port of Seattle chief executive Tay Yoshitani, Gregoire told a news conference that time had run out on deciding what to do about the earthquake-prone elevated roadway. She touted the nearly 2-mile-long tunnel as a state-of-the-art solution. The 55-year-old concrete viaduct, part of State Route 99 and used by about 100,000 vehicles a day, was damaged in the Nisqually Earthquake in early 2001. 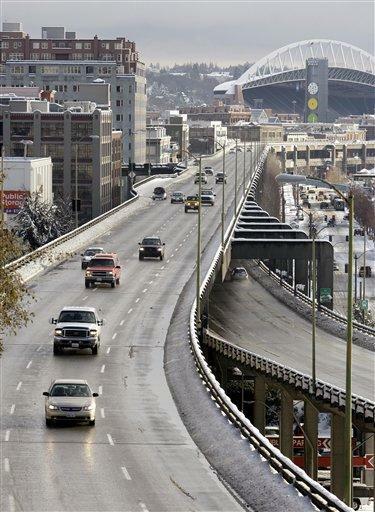 “We want to take the viaduct down before Mother Nature beats us to the punch,” Gregoire said. The decision was a major victory for Nickels, a vigorous advocate of an out-of-sight replacement for the 2.2-mile double-decker structure. Critics say the viaduct blocks or intrudes on views of Elliott Bay, West Seattle and the Olympic Mountains from parts of downtown. Its proponents say it’s a vital route to speed motorists past downtown’s congestion, while affording them a view that otherwise would be limited only to the wealthy. State transportation officials long favored building a new elevated roadway at a lower cost — more than $3 billion, about the same as tearing down the viaduct and improving surface streets. Meanwhile, Elizabeth Campbell of the group Yes Viaduct! filed an anti-tunnel initiative in the city clerk’s office before joining half a dozen pickets outside the news conference. If the measure passes muster with the city attorney’s office, the group will have 180 days to gather nearly 18,000 signatures required to put the measure before the City Council, which could then enact it into law, reject it and send it to a vote of the people or adopt an alternative that would go on the ballot as an alternative to the initiative. Campbell said the initiative could be on the ballot by this fall and should not hold up the project because it will proceed during a period of environmental review that must be completed before construction can begin. Gene Hoglund, co-chairman of the group, said the proposed tunnel would leave the city without an effective transportation link between the fishing fleet in Ballard and critical marine industry infrastructure and suppliers south of downtown. “This is going to destroy the maritime industry as we know it in Seattle,” he said. Gregoire conceded that a key unresolved question is how to transport paint, toxic chemicals, flammable liquid and other materials, now carried on the viaduct but almost certain to be barred from the tunnel for safety reasons, without worsening congestion on Interstate 5. The consensus plan, announced after two years of rancorous squabbling among state and local officials, includes more downtown transit bus service, surface street improvements, widening the Spokane Street viaduct between West Seattle and I-5, expanding a now-unused waterfront streetcar line northward to the Queen Anne neighborhood and replacing a key seawall. Construction would begin in 2011 and the tunnel would be open to traffic in late 2015. She said the two-level tunnel was vastly different from a six-lane, cut-and-cover tunnel proposal that was rejected by 70 percent of city voters in a nonbinding referendum on March 13, 2007. Reducing the project to four lanes — one fewer than in each direction of the viaduct — and technological improvements in the past two years lowered the cost enough to make deep boring more affordable, Gregoire said. She bristled at comparisons with the Big Dig in Boston, a series of tunnels, ramps and bridges that ballooned in cost from $2.6 billion to more than $14.8 billion in the two decades it took to design and build. But she said she planned to visit Boston “to find out what went wrong” so similar problems could be avoided in Seattle. As proposed, the tunnel would be 54 feet in diameter, with 12-foot traffic lanes, a 4-foot shoulder on the left and an 8-foot shoulder on the right. Unlike the viaduct, there would be no exits or entrances between the south portal near the Mariners’ and Seahawks’ stadiums and the north portal on Aurora Avenue North, three blocks east of the Seattle Center. Building the tunnel, which would have a projected capacity of 80,000 to 85,000 vehicles a day, would create an estimate 10,000 jobs for the next decade. Of the cost, $2.8 billion would come from money previously committed by the state but still requiring legislative approval. The city’s $930 million share would go for the seawall, relocation of utilities and amenities. The county would seek state approval for a motor vehicle excise tax of 1 percent to provide $190 million, and the port would chip in $300 million. residents” and the possibility of cost overruns. Rep. Dan Roach, R-Bonney Lake, noted that the Legislature has approved $2.4 billion for a viaduct replacement, leaving more than $400 million he said would likely have to come from other projects that were supposed to be funded by revenue from a 9.5-cent gasoline tax increase approved in 2005. “What projects are going to be lost because of it?” Roach asked. Sen. Cheryl Pflug, R-Maple Valley, who proposed a deep-bored tunnel with six lanes she said would cost $1.1 billion in 2007, issued a statement praising the construction method but questioning the cost of the governor’s plan.